Interruption of the inferior caval vein is a rare anomaly with an estimated incidence of 1 in 5,000 cases. When interruption occurs, there could be azygos continuation or other patterns like blood flow being directed to a plexus of hepatic veins, or anomalous drainage of the inferior caval vein into the portal vein may occur. , Interruption of the inferior vena cava could make percutaneous closure of an arterial duct a challenging procedure. Various options, including right internal jugular vein approach, retrograde transarterial approach, and the conventional right femoral vein approach have been reported to be successful. ,, We report a case of large patent arterial duct with interruption of the inferior caval vein and azygos continuation; the patient underwent successful closure of the ductus through the conventional right femoral vein approach. 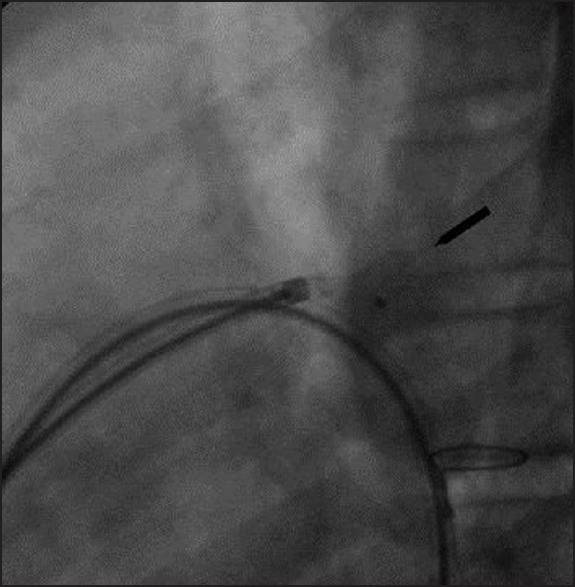 A 12-year-old girl who presented with dyspnea on moderate exertion and palpitation since three years was admitted for percutaneous closure of a patent arterial duct. Her infancy and childhood period were unremarkable and without cardiac symptoms. Her weight was 39 kg and height was 149 cm. Her blood pressure was 120/60 mmHg. Peripheral pulses were bounding. Precordial examination revealed active precordium with the point of maximum intensity shifted downward and laterally. There was thrill and continuous murmur over the left second intercostal space. Chest X-ray showed marked cardiomegaly. Electrocardiogram (ECG) showed sinus rhythm with a rate of 80 bpm and left ventricular hypertrophy. Echo showed dilated left atrium, left ventricle, and pulmonary artery, and a patent ductus arteriosus (PDA) of about 6 mm with a continuous left-to-right shunt. Under general anesthesia, arterial access was established through the right femoral artery with a 4F introducer and aortic pressure was measured (86/53 mmHg, mean: 69 mmHg). Then, aortic angiogram was done [Figure 1]. A duct measuring 5 mm was seen. On right heart catheterization, it was found that the inferior caval vein was interrupted and that there was azygos continuation. 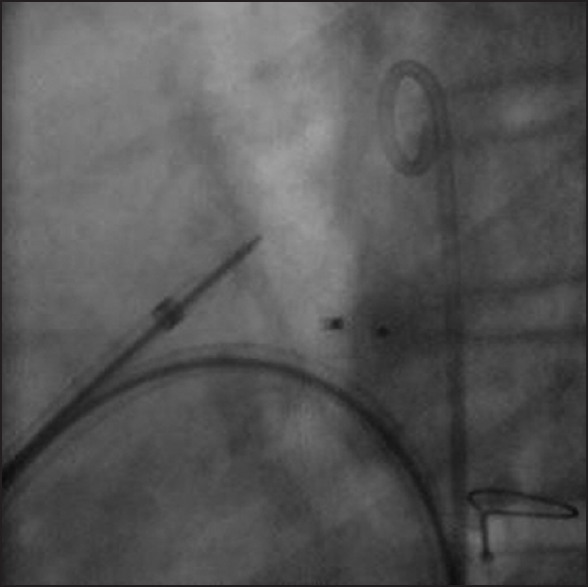 A Terumo catheter was advanced and snared in the descending aorta. An AGA exchange wire (.035" × 260 cm) was advanced through the catheter and snared in the descending aorta. 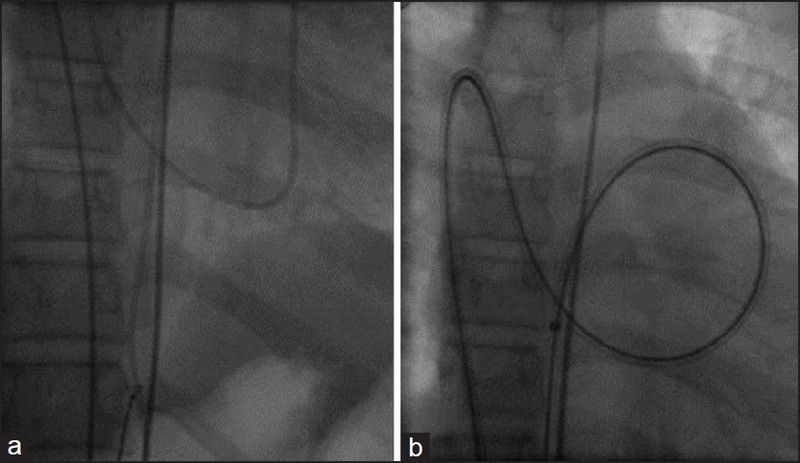 While snaring the wire, an Amplatzer TorqVue 2 delivery sheath 6F, 60 cm long (AGA Medical Corporation, Golden Valley, MN) was advanced over the wire from the venous side and again snared in the descending aorta [Figure 2]a and b. An Amplatzer duct occluder (ADO) size 8/6 was advanced through the sheath while still holding the sheath with a snare [Figure 3]a-c. The device was opened, again with the sheath still snared. The sheath was then unsnared once the aortic disc was completely out. The sheath and the device were pulled back into the duct and the device was successfully implanted [Figure 4]. The device was then released and it attained a stable position [Figure 5]. An aortic angiogram was done after the device was released, showing complete occlusion. The patient remained stable and there was no hemodynamic instability anytime during the procedure. She was extubated immediately. What was done in our patient was similar to the technique reported by Al-Hamash. The most important issues are preparing a long catheter and appropriate snares to establish an arteriovenous loop, which is the key for the success of proper delivery and stability of the device. Even though snaring of wire and delivery catheter (especially shorter sheaths like in the present case) has a significant risk of traction and hemodynamic instability in a long circuitous course, it did not happen in this patient. ADO II device was not available and the size of the PDA seemed too large for such a device. The patient had been given heparin, and so, the right internal jugular vein approach could be dangerous. The authors thank Dr Belay Abegaz, founder of the Children's Heart Fund of Ethiopia and the cardiac center for enabling pediatric cardiology practice in the country. They also extend their gratitude to all the staff of the cardiac center and the Spanish mission members. 1. Bronshtein M, Khatib N, Blumenfeld Z. Prenatal diagnosis and outcome of isolated inferior vena cava. Am J Obstet Gynecol 2010;202:398.e1-4. 2. Akhtar S, Samad SM, Atiq M. Transcatheter closure of a patent ductus arteriosus in a patient with an anomalous inferior vena cava. Pediatr Cardiol 2010;31:1093-5. 3. Sivakumar K, Francis E. Anomalous inferior vena cava drainage to portal vein offers a challenge to transcatheter ductus arteriosus closure. Pediatr Cardiol 2007;28:416-7. 4. Al-Hamash S. Transcatheter closure of patent ductus arteriosus and interruption of inferior vena cava with azygous continuation using an amplatzer duct occluder. Pediatr Cardiol 2006;27:618-20. 5. Patel NH, Madan TH, Panchal AM, Thakkar BM. 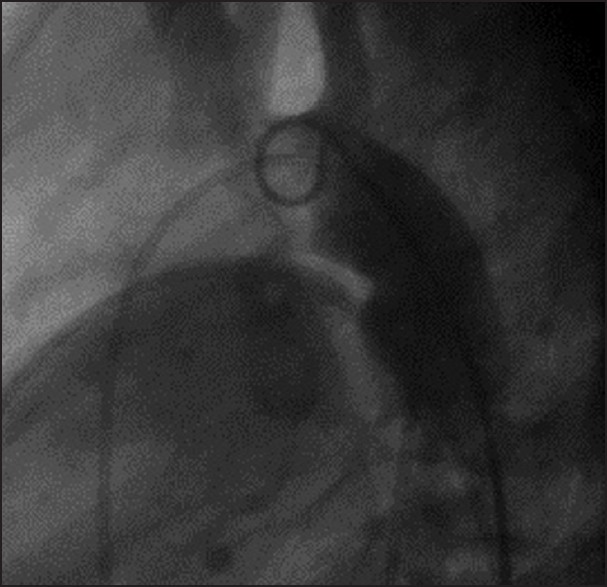 Percutaneous closure of patent ductus arteriosus via internal jugular vein in patient with interrupted inferior vena cava. Ann Pediatr Cardiol 2009;2:162-4. 6. Koh GT, Mokthar SA, Hamzah A, Kaur J. Transcatheter closure of patent ductus arteriosus and interruption of inferior vena cava with azygos continuation using an Amplatzer duct occluder II. Ann Pediatr Cardiol 2009;2:159-61.